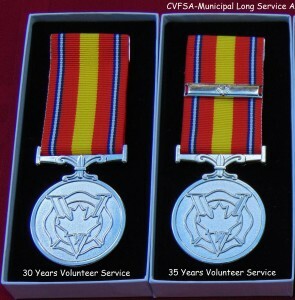 The medal is available from the CVFSA to municipal units who wish to recognize members of their volunteer firefighting community. This medal ensures that a national standard is maintained as to appearance, presentation, and awarding of such a medal. Municipal units can include incorporated villages, hamlets, towns, cities, and government structures, below the federal and provincial territorial level. Must be alive on the date on which a nomination was submitted and the medal can be presented posthumously as long as the medal has been awarded within 365 days of the death of an individual named on the nomination. The medal can only be awarded through a nomination form signed by two nominators of which one signature must be an active fire chief of the individual nominated or the mayor of the municipality of the individual being nominated. The medal is not available to an individual by sale as a product, as medals will not be sold to individuals. The medal is to honour volunteer firefighters or firefighters that provide service to their communities without payment of regular wages or as non-career firefighters. The individual must have completed at least 30 years of service in the performance of their duties involving potential risks. There are no post-nominal authorized with this medal. The National Board of the CVFSA reserve the right to award by majority to an outstanding individual as deemed appropriate. A Bar(s) bearing a stylized maple leaf (standard) or a symbolic emblem as approved by the host municipal unit may be awarded to a recipient of the medal for each additional five year period of service up to 50 years’ service. Bonny River Fire Department, NS. Lunenburg & District Fire Department, NS. Conquerall Bank Fire Department, NS. Pleasantville & District Fire Department, NS. Cowichan Bay Volunteer Fire Department, BC. Lunenberg & District Fire Department, NS. 30 years of service Fire Chief Clair W.
New Germany Volunteer Fire Dept. Petite Rivière Volunteer Fire Dept.